I sustained a spinal cord injury in late 2009. At the time, I had little or no understanding how life changing this was to become. I had an extremely complex rehabilitation in the Spinal Injuries Unit and was eventually discharged in January 2011. Whilst an inpatient in the Spinal Unit I met Alan – ‘Hammer’ whilst he was conducting an education session. The beginning of my new life – Wow where to start. I had been employed in sport and education for a very large chunk of my life and have always been aware of the merits and benefits of physical exercise. My plan was and has continued to be to improve and maintain my core strength to enable me to be as independent as possible. 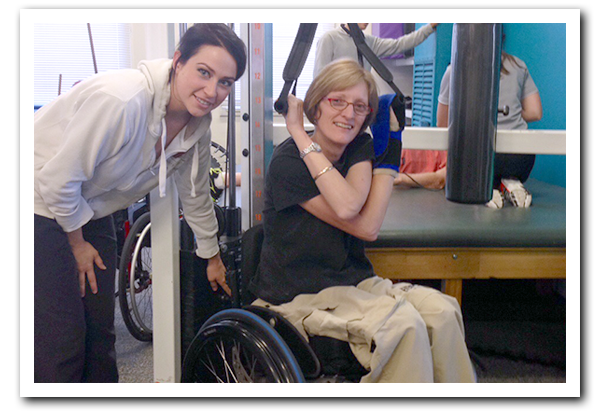 A gym was the obvious place to start however finding one that had equipment that could be used whilst sitting in a wheelchair was not quite impossible, but very difficult. In the search I discovered Sporting Wheelies and Disabled Association, and also found that they had an adapted gym for the use of its members. With the support of the extremely knowledgeable gym staff, I commenced a regular gym program; I have improved beyond my wildest imagination, and have seen others do the same. The gym has become an integral part of my life, and the network formed with other like-minded people is equally valuable. I believe that this is the only facility in Brisbane that has a gym that is accessible to both able bodied people and others with varied abilities. The association’s activities are not just limited to the gym; I soon discovered their involvement in a wide range of sports encouraging both young and old, from the beginner/novice level through to the elite Paralympians.